This the season for peaches! Peaches are a widely popular delicious, juicy fruit. It is actually a member of the rose family and originated in china, now popular in all over the world. Peaches contain all essential nutrients including carbohydrates, proteins, vitamins, minerals and fibre that offer numerous health benefits. Read on to learn about the 6 incredible health benefits of peaches! Peach is an ideal diet for dieters. Peaches contain bioactive components that have shown beneficial effects in combating obesity-related disorders. Plus, wonderfully delicious peaches are low in calories (100 g just provide 39 calories) and contain no saturated fats. The high amount of sugar in peaches is natural and therefore does not have an adverse effect on health. Peaches area great source of vitamins A and C, which are highly essential for skin health. Vitamin A and C make peaches a natural moisturizer, they’re often used in cosmetics. As with many fruits, most of the vitamins and minerals are contained in the peach’s skin, so keep in mind that you need to eat the fruit along with its skin because peeling it will actually take away all the extra benefits that the fruit offers. You can also rub peaches directly on your skin to help get rid of wrinkles and dark circles. All fruits rich in fibre will help your digestive system to work smoothly, and peaches are one of them. 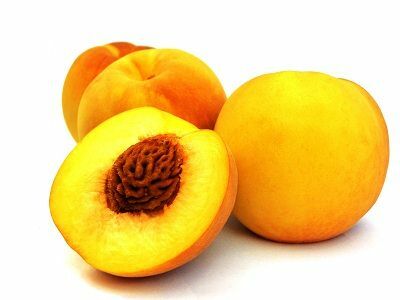 Dietary fiber in peaches absorbs water and helps in preventing stomach disorders like constipation, hemorrhoids, stomach ulcers, gastritis and irregular bowel movements. It also helps to remove worms from the intestines and calm an upset stomach. Peaches are rich with antioxidants that help prevent cancerous cell growth. A recent research show that two phenolic compounds (chlorogenic and neochlorogenic) in the peach can kill breast cancer cells while leaving normal cells untouched. Researchers indicate eating 2–3 peaches a day could prevent cancer. Peaches contain antioxidant and compounds like lycopene and lutein, that help reduce the risk of heart disease to a great extent. The peaches also contain a high amount of potassium and very low sodium, which can help you maintain healthy blood pressure. In addition, the iron content of peaches are good for those with anemia, including some pregnant women. Do your cardiovascular system a favour and go eat some peaches! If you want healthy eyes and improved vision, you should surely eat peaches. Peaches are rich in beta-carotene, which gets converted into vitamin A within the body, and vitamin A is crucial to the health of our retinas. The beta-carotene also nourishes and protects the retinas in your eyes from free radical damage, as well as helps prevent night blindness and age-related macular degeneration.